10:55- It’s baaaaaaack. And from historic Beaver Stadium. Keep it here for a running diary of today’s big game. Also, as you all prepare, head over to my preview at MAC Report Online for the players thoughts heading in to today’s game. 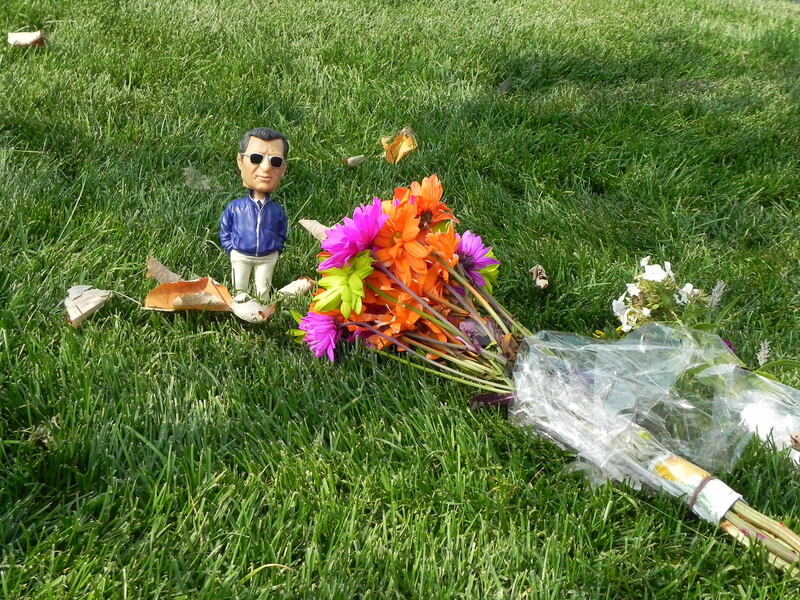 10:59- The Joe Paterno statue outside Gate F here is gone but some fans have left a tribue to their former coach. This is the first time that Penn State is opening a season without Paterno as head coach since 1965. 11:11- Teams on the field for warm-ups. Although the student section is still well empty, the roars for each Lions unit as they take the field has been impressive. Ohio rocking their new green helmets that scream Michigan State. -Ohio and Penn State are meeting for the first time since 1974. -The Bobcats come into today’s game winning six of their last seven games. -A win today would be the Bobcats’ first over a Big 10 team since they defeated Illinois in 2006. -A win today would be the first for Penn State since 1997. Yes, that is not a misprint. According to the NCAA sanctions they accepted, they vacated all wins between 1998 and 2011. -The Nittany Lions have also technically defeated a MAC team since 1992. 11:22- A big question heading in to this game will be the play of PSU quarterback Matt McGloin. It’s no secret that he struggled through much of 2011. If the Bobcats get pressure to him early and often, the defense should be in good shape. 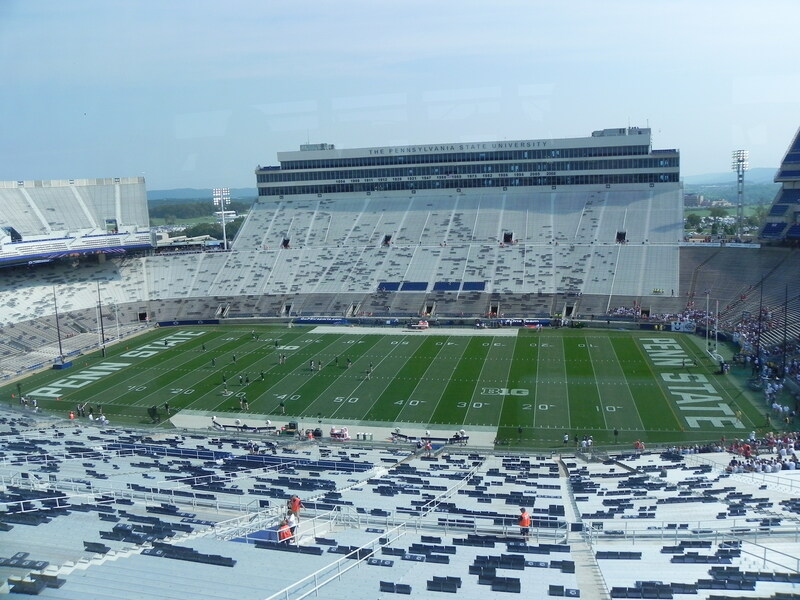 11:32- Penn State sold out of 21,000 student season tickets in a day this summer. To put that in perspective, Peden Stadium, the home of the Ohio Bobcats holds 24,000 people total. 11:39- It’s a stupid thing, I know, but there is nothing quite like sitting back and watching a place like Beaver Stadium go from having 0 people in it to 100,000 in a matter of two hours. 11:41- Internet is apparently going to be an issue today, so apologies if the updates are light. 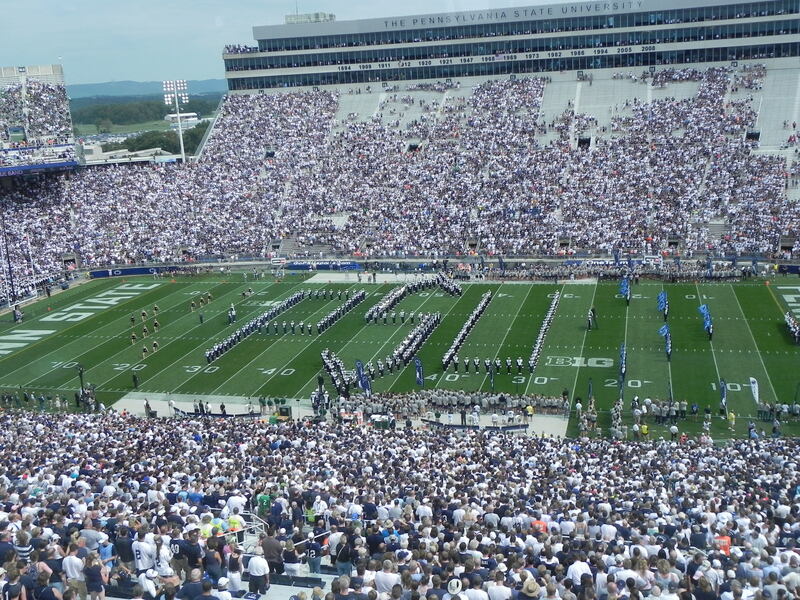 11:53- It’s game time in Happy Valley. 12:00 – PSU is debuting a new branding today, using the slogan “One Team”. It’s being used to brand the athletics program as a whole. 600 student-athletes formed a tunnel to welcome the players on the field. It truly is a new era here. 12:05- Penn State to receive after Ohio wins the toss and defers. This could be one of the biggest drives in recent history for both teams. 12:13- Methodical drive from PSU here. Lots of play-action and spreading of receivers has Ohio out of position most plays. Lions marching down the field and about to enter red zone. 12:16- Two missed tackles on a fourth and third down costing Ohio. Drove fans crazy with the last year. 12:17- Drive looked hopeless for Ohio until Belton coughs up the ball after a hit by Gerald Moore. Time for the big matchup: PSU Defense vs. Ohio Offense. 12:22- Just like that, Ohio goes three-and-out. Don’t be surprised if that is common, especially early. Grant Venham’s first career punt travels 53 yards and pins the Lions inside the 20. 12:23- Penn State takes over again but is quickly stopped. Matt McGloin is 8-for-11 throwing through two drives. 12:36- Ohio gets things going on their second drive, but stall out at the 35 of Penn State. They punt but the ball goes into the end zone. Thought going for the 52-yard FG with Weller would be worth a 16-yard change in field position. 12:44- Ohio’s refusal to press receivers is giving McGloin and Co. all day to set up. 12:50- That score by PSU was the first for them in 14 years. 12:59- Yet another miscue puts Ohio in business. A dropped punt inside the 15 puts Ohio in the red zone. ‘Cats go three-and-out and have to settle for a FG. Needed a TD there. 7-3 PSU with 10:22 left in the half. 1:11- Big swing yet again for Ohio, an apparent catch by PSU at the Ohio 35 overturned and PSU punts. Tettleton needs to get more throws in, as he only has 10 at the moment. 1:16- Tettleton getting others involved and it is paying off. They have marched all the way down to the PSU 35 in seven plays. Tettleton now 10-for-14 for 92 games. Big 4th-and-2 on the PSU 27. 1:21- That’s disappointing. Ohio marches all that way only to settle for a 44-yard FG which Weller pushes left. Seems an awful lot like the offense we saw late last year. 1:26- Nice sequence for the defense who gets a quick stop. Time for the ‘Cats to get agressive since they could go two-for-one to start the second half. 1:29- Or not. They go three-and-out and get the punt blocked. PSU takes over inside the Ohio 20. 1:34- So. Many. Arm. Tackles. PSU goes up 14-3 after just three plays in the red zone. McGloin to Lehman from 14 yards out. Just a horrible swing. 1:30 to go in the half. PSU 14 Ohio 3. -Things could be a lot worse for Ohio, but they could be much, much better. They certainly don’t deserve to win at this point, that’s for sure. -Their preparation of handling the passing game has been less than stellar. They were planning on letting McGloin throw all day, but he has made them pay. 16-for-26 for 178 yards and 2 TDs with no picks sounds like a dream for a Lions fan. -Where is the big play on offense? It helped the ‘Cats get things going in numerous games last year, but they seem to be sitting back today. They have attempted one pass over 10 yards. Solich and Co. love some trickeration to keep the defense on their toes. -Tyler Tettleton has been good as advertised. 15-for-22 for 117 yards. Would like to see him try and make a big play here in the second half. He looks a little afraid at times. -Total yardage: PSU 237 Ohio 198. Not nearly as bad as you would think. -Time of Possession: Ohio 15:02 PSU: 14:58. The ‘Cats clearly controlled the 2nd quarter. Needed to finish, though. -Final conclusion: Ohio is still very much in this game. It is really just a matter of not missing opportunities like they did in the second quarter and shoring up the passing defense. Now that the ‘Cats have a feel for Bill O’Brien’s offensive scheme, it seems possible that they can get things fixed on defense. -Stay tuned through the end of the game for updates. 2:07- National TV games absolutely ruin the flow of the Ohio offense. A 20-second break for an injury just turned into a three-minute break. 2:14- What a break for the Bobcats. On a third-and-seven from the PSU 43, Tettleton forces a throw that gets tipped but right into the hands of Landon Smith who takes it to the house. 14-10 PSU with 10:40 to go in the third. An 82-yard drive which was just what the doctor ordered. 2:26- Color me impressed with the Ohio secondary this quarter. They get the big stop on defense on fourth down on the Ohio 35 and then the offense goes for some razzle-dazzle on a double reverse for 11 yards. 2:35- Incredible turn of events here in Happy Valley. It’s Tettleton Time as he leads the Bobcats for a 72-yard scoring drive. Ohio leads 17-14. Crucial sequence for the defense here. 2:43- Defense gets a quick stop and the offense is back on the field. Tettleton getting stretched out a lot, may be suffering from cramps. 2:47- The 3rd ends and the Bobcats are in the lead 17-14. Just 15 minutes away from history. 2:48- Great stat from Athens Messenger beat writer Jason Arkley. Ohio has outgained PSU 302 yards to 113. 2:54- Not a day to remember for senior kicker Matt Weller who misses his second kick of the day. PSU takes over on their 22-yard-line. 3:00- Ohio gets the stop. 9:37 to go in the game and will take over on their own 7. A long scoring drive will all but certainly put this game out of reach. 3:26- What a finish. Ohio running this one out. Truly the greatest in the history of the program. The Ohio Bobcats had their first full-contact scrimmage Tuesday afternoon, giving a lot of the young players their first chance to show their skills at full-speed, while veteran players get an opportunity to jockey for more playing time. Although many starters on both sides of the ball sat out, and many veteran players only played a couple of drives, the defense really impressed me whether it was first-string or third-string. The offense only had one scoring drive on the afternoon, led by the second unit. The linemen and linebackers handled the run very well, filling holes quickly and giving the running backs fits. The secondary made the quarterbacks and receivers earn every catch. It was a fine display of the defensive depth that the team will have the next few years. While the defense won the day, the offense wasn’t unpolished by any stretch. From top to bottom, they played very fast, taking an average of 10 seconds between plays when running their no-huddle. The Bobcats gained an edge by playing so quickly in 2011, and they look to exploit it more in 2012. Of the 2012 recruiting class, running back Daz’mond Patterson may be the most intriguing player in my opinion. Listed at just 5-foot-6 and 178 pounds, he looks like the kind of player that has no right playing in the FBS. But judging by the reps he got with the first-team, (Ryan Boykin and Beau Blankenship sat out) it seems like he may be the one carrying the running game a few years from now. His size gives him a low center of gravity and an ability to fit in holes that your prototypical 6-foot, 200 pound running back can’t. Fans will want to keep an eye on his progress. Following the transfer of Kyle Snyder, sophomore quarterback Derrius Vick (no relation to Michael or Marcus) is now the No. 2 behind Tyler Tettleton. He looked a bit lost in practices at times last year, but he has gradually built up his athletic frame and played in Tuesday’s scrimmage with plenty of confidence. His throws were more sharp and didn’t let the relentless defensive pressure get to him too much. If he continues to improve, life after Tettleton may not be as bad as originally thought. The Bobcats have one more scrimmage before the start of the season, and then their first regular season game on September 1 at Penn State. When it comes to college football, your first impressions of the team comes from the media day the team holds shortly after the beginning of camp. It’s usually the first time that you get to meet one-on-one with the new leaders of the team. You get a feel for what is going on during fall camp, which is a completely different thing than spring ball. When it came to the Ohio Bobcats media day, your first impression was that this team is on a mission. Some would be happy with a 10-win season, or the first bowl win in school history, but not these Bobcats. The loss in the MAC Championship to Northern Illinois still sits with a lot of these guys, and they are going to do everything they can to win Ohio’s first MAC title since 1968. This team knows they have a lot of work to do to achieve their goal, but in talking with them you really see that they are confident that this is the year. Here are the highlights and my first impressions of the players I got to talk with. Replacing a playmaker that is about to crack the Indianapolis Colts starting lineup as a rookie isn’t easy, but that is what Donte Foster and the rest of the Bobcats wide receivers must do following the graduation of LaVon Brazill. After a disappointing spring, the receivers have shown up to fall camp ready to work. After talking with Foster, you get the feeling that the passing game will be just fine. The first thing you think when you talk to Jordan Thompson is that he has to be a coach when he is done playing. Now entering his third year as a starter, you feel like Solich was talking directly about Thompson when he mentioned the great leaders the team has. Playing one of the tougher positions on offense, he emerged as one of Tyler Tettleton’s favorite targets in a pinch and hopes to help him lighten the load in 2012 as well. “I wouldn’t say it’s tough, I think it’s more fun because you get the physicality of playing on the line and then you also get to go out and catch some balls. So I think it’s a lot of fun being versitale and being able to do a little of both. Although he has a quiet demeanor, few play on the Bobcat defense with the amount of intensity that Neal Huynh does. Huynh was in the middle of a breakout season before a knee injury ended his 2011 prematurely. Coming in to 2012, you have a feeling he is going to come out more fiery than ever and help the defense improve. There is no doubt that Beau Blankenship is the easiest Bobcat to recognize across a room. Besides being one of the few white guys that can pull off putting his hair into dreadlocks, we learned in 2011 that he is a talented running back and one of the most fun guys to be around on the team. After the departure of Donte Harden, he will be expected to carry the bulk of the load at running back. In his first year as a starter in 2011, Tyler Tettleton led the Bobcats to their first ever bowl win, smashing many passing records in the process. Entering year two, you can really tell that he is more relaxed under center and ready to take more control of the offense. MAC defenses beware. The Bobcats open the season on September 1 at Penn State.